Jim Malone | VOA Aug 9, 2018. WASHINGTON — President Donald Trump and his Republican supporters are claiming victory in a special congressional election in Ohio, even though officially the race remains too close to call. The race was seen by many as a possible bellwether for the midterm congressional elections in November. Republican Troy Balderson leads Democrat Danny O’Connor by about 1,700 votes, but a few thousand provisional ballots remain to be counted. Even if the Republican eventually emerges victorious in the Ohio race, opposition Democrats also see plenty to be optimistic about as they look ahead to the November midterms, when all 435 House seats will be at stake along with 35 of the 100 U.S. Senate seats. 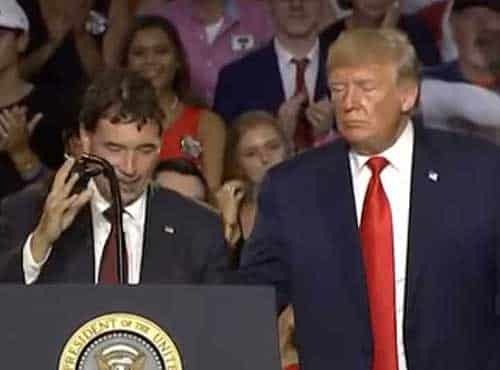 President Trump held a rally in Ohio a few days before the voting on behalf of Balderson, and many analysts believe that may have tipped the election in Balderson’s favor. In remarks to his supporters Tuesday night, Balderson was quick to pay tribute to the president for his last-minute help. Balderson benefited from large campaign contributions from the Republican Party’s campaign arm to offset heavy Democratic spending in the race on behalf of Danny O’Connor. For the most part, O’Connor tried to stay focused on economic issues and health care and was less interested in making Trump the central issue in the race. O’Connor’s strong showing came in a district that Republicans have held for more than three decades and which Trump carried in the 2016 election by more than 11 points. In his rally Saturday on behalf of Balderson, Trump laid out a template for future campaign attacks as he strove to take the focus off of him and aim squarely at opposition Democrats. The fact that Democrat O’Connor ran a close race in a strongly Republican district, however, strikes experts as yet another warning sign for Republicans in November. “It is more evidence that in race after race throughout this year, Republicans have been underperforming the levels that they were at in 2016, which has to spell trouble for them moving forward,” said Brookings Institution analyst John Hudak. Balderson also received help from Ohio Governor John Kasich. On Sunday on ABC’s This Week, Kasich predicted a narrow Republican victory in the election, but he also warned that Trump remains a polarizing figure for the broader electorate. “The chaos that seems to surround Donald Trump has unnerved a lot of people. So suburban women in particular here are the ones who are really turned off,” Kasich told ABC. So on one hand, the Ohio results suggest the president can tip a close race into the Republican column. “Oh, I believe the president does think that his ability to weigh in and endorse a candidate can have an effect,” said analyst Hudak. But Hudak also argued that in addition to motivating his own base, Trump also is proving to be a turnout motivator for Democrats who want to show their displeasure with him. No matter who is declared the eventual winner of Tuesday’s special election, Balderson and O’Connor are expected to face off again in November when it is likely that Trump will once again be the pivotal issue for voters in midterm elections where the control of Congress is at stake.